NJ Pest provides complete inspections for pests and wildlife prior to purchasing your new property. We inspect from a different perspective than a traditional real estate inspector. We look for existing pest and wildlife problems as well as potential problems that can occur. What distinguishes NJ Pest Control from other pest control firms? NJ Pest prides itself on education and team development. NJ Pest is one of a handful of companies that are QualityPro® Certified by the National Pest Management Association (NPMA). The QualityPro® Certification is currently earned by less than 3% of all pest control companies nationwide. NJ Pest is 1 of 18 companies in New Jersey that have obtained Quality Pro® certification. This widely respected certification requires pest management companies to ascribe to a comprehensive set of standards. The QualityPro® designation demonstrates a commitment to excellence and provides consumers with an easy way to identify and be confident in their selection of a quality, pest management provider. We have an Associate Certified Entomologist (ACE) and Certified Wildlife Control Operators on staff to handle any issue that you may have. Our experts have in-depth knowledge and hands-on experience in solving complex and involved pest and nuisance wildlife situations. We are known as a reliable, honest and cost-effective team of professionals. We are committed to continuing our education, using up-to-date technology, and conducting on-going research of new products and techniques. What a consumer needs to know about a thorough pest control inspection for real estate transactions. The presence of wood destroying insects or wildlife can have a severe impact on the condition of the house. This evidence is often misidentified as something else. Home purchasers need to know if these pests are present before investing their hard earned money. Having your future home inspected by NJ Pest, who can detect the presence of wood destroying insects and any existing and potential wildlife intrusions, is an important part of your home inspection process. NJ Pest may be selected by the seller, his agent, lending institution, or the buyer. As a purchaser, you should be advised as to which company is doing the inspection and as a buyer, you can make the selection. We will perform a full inspection and give a remediation as well as a preventive approach to any potential concerns or issues. I already have a home inspector, why should I have another inspection done by NJ Pest? Home Inspectors look at the house as a whole and evaluate all the various components, roof, heating/cooling systems, etc. Our technicians are trained in identifying and addressing pest and wildlife issues. We often have the same concerns on areas of the home, as a home inspector, but usually for a different reason. What is on the report? What types of pests? The report will cover all types of wood destroying insects, termites, carpenter ants, carpenter bees, powder post beetles. The report will also identify if there is any past or current evidence of wildlife such as squirrels, raccoons, bats etc. Carpenter Bees: A wood boring bee often found in the eaves of homes. Beetles: Powder post beetles – small beetles whose larvae feed in hardwood such as oak, anobiid beetles – small beetles whose larvae feed in softwood such as pine, and old house bores – rather large beetles whose larvae feed in softwood timbers. Carpenter Ants: Usually possible when moisture problems are common in the area. In some areas, the report may not include wood rot. This is caused by a combination of moisture and fungal growth and can be very destructive. Are these pests found in all houses throughout NJ? Every home has the potential of encountering these issues, it just a matter of when. NJ Pest will send out a certified licensed technician to perform the inspection. The inspector looks at all visible areas of the structure that are readily accessible. If our inspector finds evidence of any wood destroying insects, the inspector reports these evidences on a NPMA-33, WDI form. No! The report gives the findings of a trained inspector who, at the time of the inspection, searched for visual evidence of these pests in the readily accessible areas of the structure. View an inspection as a ”photograph in time” as to visible evidence in readily accessible areas. NJ Pest will recommend and propose the appropriate solution to control the pest or animal. For termites, a treatment will be warrantied for a year, usually meaning if an infestation is found while the warranty is in effect, NJ Pest will take additional steps to control wood destroying insects at no additional charge to you. For wildlife, a detailed, itemized proposal and action plan will be provided to not only remediate the animal but recommend ways to prevent future issues. NJ Pest Control is a WDI Credentialed termite and wood destroying insect inspection company. That means an inspector has gone through a comprehensive, challenging course that tests abilities to properly identify and report termite as well as other wood destroying insects. At the conclusion of the classroom training, a written examination will be issued to the attendees. 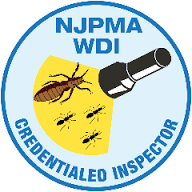 A passing score of 75% or higher is required on the written exam to obtain the NJPMA WDI Inspector Certification. Each applicant will have 2 hours to complete the written examination. Why should I choose a Credentialed Inspector? Selling or purchasing a home is one of the largest decisions you may have to make in your life. This process can sometimes be confusing to navigate through. There are many firms to choose from to do the necessary inspections. Unfortunately, the State of New Jersey does not have any rules, regulations, requirement, licensing, training or pre-requisites of any kind to govern those who perform these inspections. Literally ANY ONE who chooses to hire themselves out can perform a Wood Destroying Insect inspection. What special qualifications does a Credentialed Inspector have? How can choosing a Credentialed Inspector benefit me? Every Credentialed Inspector has gone through a specialized course of detailed instruction and has successfully passed an exam in each section of the course. They have also had to meet very specific prerequisites before receiving their final “Credentialed” status.